Product #2323 | SKU UFO202 | 0.0 (no ratings yet) Thanks for your rating! The U-CONTROL UFO202 from Behringer is a low cost solution for transferring vinyl records and tapes to and from a computer. 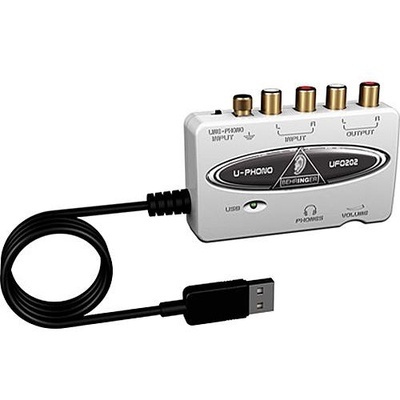 The USB 1.1 interface is USB bus powered and features 2 analog RCA phono inputs that can be switched between a line source and the phono preamp, and 2 analog RCA phono outputs for connecting active speakers or studio monitors.